This morning I woke up and asked Katie "If you could eat anything, what would it be?" Katie is a member of Leverage Dance Theater and this weekend was opening weekend of their latest show "Am I the Only One." The show has been great and they have two more performances next Saturday! Today was her first day off of work and dance in quite some time so I thought we should have a nice brunch. She picked Belgian Waffles with whipped cream and strawberries. The whole foundational premise of rotio/food is that "food, like life, is meant to be shared." My passion is feeding the people I love food that they love and sharing a meal with them. Sourdough belgian waffles with berries, whipped cream, and a Budweiser at the table with my fiancee on our Sunday off was perfect, and I'm so happy to be able to share that here. 1. Mix all waffle ingredients in large bowl. 2. Preheat and grease waffle iron. 3. Beat all topping ingredients (except strawberries) until stiff peaks are formed. 4. Ladle 1 cup of waffle batter into greased waffle iron and spread with ladle. Close and cook for 4-5 minutes until golden brown. 5. 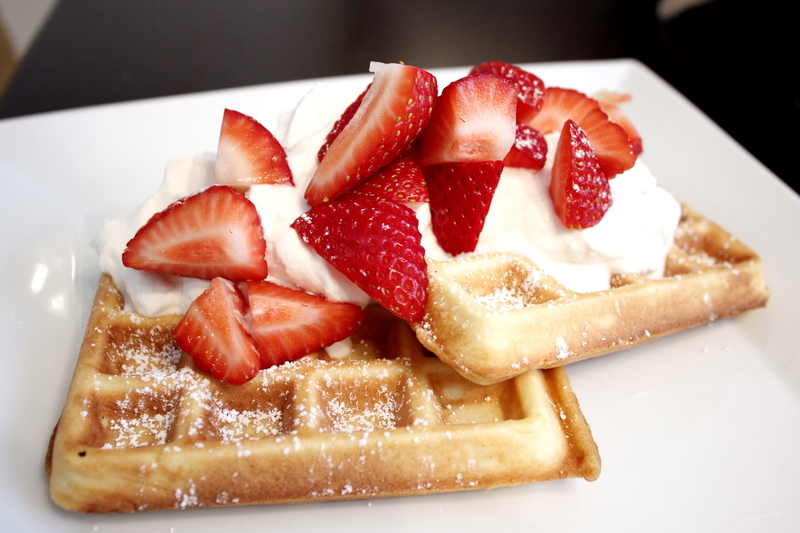 Remove waffle from iron, top with whipped cream, strawberries, and powdered sugar. Serve immediately. * "Buddy" is our pet. He's a sourdough starter that we only feed Budweiser and bread flour. He's a lot of fun and has a great personality. He's been working on his own page on the blog and a Twitter account... keep an eye out, they're coming soon!